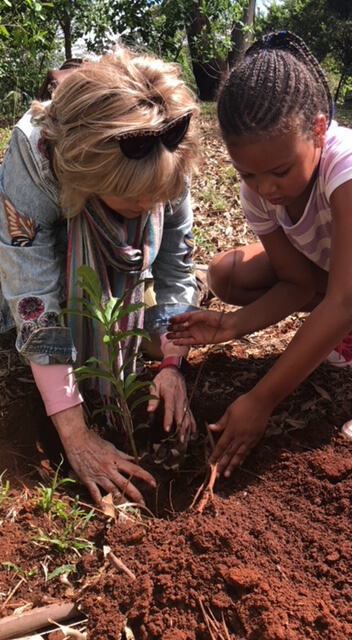 Earlier this week, I had the privilege and honor to plant trees with the daughter and granddaughter of environmentalist Wangari Maathai. In recognition of her life’s work promoting “sustainable development, democracy and peace,” Maathai received the 2004 Nobel Peace Prize. She was a lifelong activist who founded the Green Belt Movement in 1977. With that in mind, here are 10 TEDWomen talks from over the years that highlight innovative ideas, cutting-edge science, and the power that each of us has to safeguard our planet and make our world better for everyone. 1. Climate change is unfair. While rich countries can fight against rising oceans and dying farm fields, poor people around the world are already having their lives upended — and their human rights threatened — by killer storms, starvation and the loss of their own lands. Mary Robinson asks us to join the movement for worldwide climate justice. 2. Ocean expert Nancy Rabalais tracks the ominously named “dead zone” in the Gulf of Mexico — where there isn’t enough oxygen in the water to support life. The Gulf has the second largest dead zone in the world; on top of killing fish and crustaceans, it’s also killing fisheries in these waters. Rabalais tells us about what’s causing it — and how we can reverse its harmful effects and restore one of America’s natural treasures. 3. Filmmaker Penelope Jagessar Chaffer was curious about the chemicals she was exposed to while pregnant: Could they affect her unborn child? So she asked scientist Tyrone Hayes to brief her on one he studied closely: atrazine, a herbicide used on corn. (Hayes, an expert on amphibians, is a critic of atrazine, which displays a disturbing effect on frog development.) Onstage together at TEDWomen, Hayes and Chaffer tell their story. 4. Deepika Kurup has been determined to solve the global water crisis since she was 14 years old, after she saw kids outside her grandparents’ house in India drinking water that looked too dirty even to touch. Her research began in her family kitchen — and eventually led to a major science prize. Hear how this teenage scientist developed a cost-effective, eco-friendly way to purify water. 5. Days before this talk, journalist Naomi Klein was on a boat in the Gulf of Mexico, looking at the catastrophic results of BP’s risky pursuit of oil. Our societies have become addicted to extreme risk in finding new energy, new financial instruments and more … and too often, we’re left to clean up a mess afterward. Klein’s question: What’s the backup plan? 6. The water hyacinth may look like a harmless, even beautiful flowering plant — but it’s actually an invasive aquatic weed that clogs waterways, stopping trade, interrupting schooling and disrupting everyday life. In this scourge, green entrepreneur Achenyo Idachaba saw opportunity. Follow her journey as she turns weeds into woven wonders. 8. Architect Kate Orff sees the oyster as an agent of urban change. Bundled into beds and sunk into city rivers, oysters slurp up pollution and make legendarily dirty waters clean — thus driving even more innovation in “oyster-tecture.” Orff shares her vision for an urban landscape that links nature and humanity for mutual benefit. 9. Beverly + Dereck Joubert live in the bush, filming and photographing lions and leopards in their natural habitat. With stunning footage (some never before seen), they discuss their personal relationships with these majestic animals — and their quest to save the big cats from human threats. If you’re interested in attending TEDWomen later this year in Palm Springs, California, on November 28–30, we encourage you to sign up for our email newsletter now to stay up to date. We will be adding details on venue, sessions themes, guest curators and speakers soon. Don’t miss the news!